The AGM (and the fourth ordinary meeting for the year) for 2002 of the MMC Inc was held at the Bri Phil Hall, Elsternwick on Sunday 11 August. Numbers were somewhat down on our usual attendance - some say that this may have been because the Hornby auction was on the same day. (Let it be known that your Committee tried to avoid this and deliberately chose 11 August which was a week before the scheduled date for the Hornby auction. But the Hornby people changed their date at the last minute - sometimes you can't win!). But in the finish we had 33 people present - 28 members, 3 family and 1 visitor. 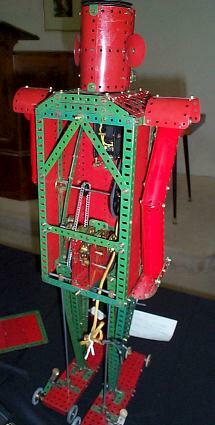 Wal Maynard had brought along several large boxes filled with all sorts of desirable Meccano parts for sale - he has decided to thin his collection rather drastically. As can be imagined this generated much interest amongst potential buyers and Wal was kept fully occupied during the first hour of proceedings. Meanwhile several other Meccanomen were busy setting up their models on the tables at the front of the hall - more about that later. But as always the first hour seemed to pass very quickly particularly since I was busy taking photos and notes about the models. This enabled me to make the observation that most of the activity was concentrated at the back of the hall (around the trading tables) rather than at the front (model display). In fact I found that it was always the same few people looking at the models whenever I wanted to compose a photo. What's the significance? Don't know - work it out for yourself! At 2 pm our President Tony Press called us to order for the third Annual General Meeting of the MMC Inc. The President reported that our Club has had another excellent year, with our regular bi-monthly meeting attendance numbers growing. He thanked all members for their support. Membership has steadily increased, with new members more than replacing those lost - present membership is 74. The Secretary, Graham Jost, maintained our Committee Meeting requirements and the Treasurer, Mike Maloney, made sure our finances were well under control. 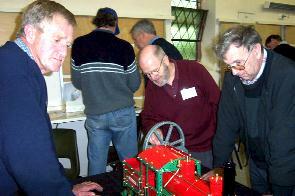 We again held a most successful Club Exhibition thanks to a very active Exhibition Sub-Committee. Our Newsletter went from strength to strength under Editor Bill Fitzgerald, and Jack Parsisson organised an amazing schedule of "other" exhibitions. Paul Johnstone kept up the Club homepage with excellent full colour renditions of every meeting and exhibition in a most timely manner. Finally Tony, as retiring President, expressed his personal thanks to the Committee who had given him great support over the past two years. The Treasurer presented his Balance Sheet and Statement for the 2001/2002 financial year - see the printed newsletter. Following the AGM our new President Mike Maloney asked Tony if he would continue to chair the informal proceedings that followed. Tony obliged and welcomed us to Meeting No 98 of the MMC Inc. 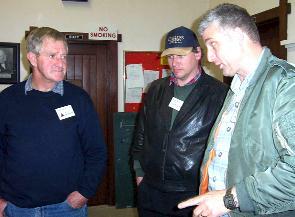 He welcomed one visitor John Mason, a friend of Michael Bankovski and even more visually impaired than Michael. John examines the models by touch and seemed to find plenty to occupy him. We hope you enjoyed your visit John. On a sad note Tony announced to us the unfortunate news that Patrick Russell-Young's wife Minette passed away at the beginning of August. The Club has sent a letter of condolence to Patrick and his family - our thoughts and sympathy are with them during this difficult time. Tony asked Kimball Monger to present an update on planning for our forthcoming annual exhibition. Kimball's first point was that the success of the exhibition is in the hands of the Club member - not him or the Exhibition Committee. So take heed. Door duty - Volunteers are needed. We will have two people at a time on duty for one-hour spells. Last year we fell down on this very badly - the Exhibition Committee does not want a repeat of this. So what about getting involved? By way of incentive there will be a prize of $60 worth of Jackarno (JP replicas, selected by the winner) to the lucky doorkeeper whose name is drawn out of the hat. Please contact Jack Parsisson on 03 9789 5796 if you can help. Insurance Indemnity. The Club's incorporation provides protection to individual members against claims of negligence but only if you are financial. Members who are unfinancial on the day of the Exhibition will not be permitted to exhibit. General Trading will not be permitted at the Exhibition. But as a concession, exhibitors only may display a limited number of items for sale, or list of items provided the total area of table space occupied does not exceed an A4 sheet of paper. You are asked to fully cooperate with this arrangement. Children Exhibitors are strongly encouraged. Note that family members exhibiting must be covered by Family Membership. Outside Exhibitors from Qld, NSW and possibly SA and New Zealand will be coming so we'd better have a good local showing! More models are needed - get those model entry forms in! 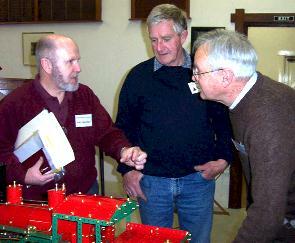 Jack Parsisson provided details of several potential exhibiting possibilities (see back page of newsletter). 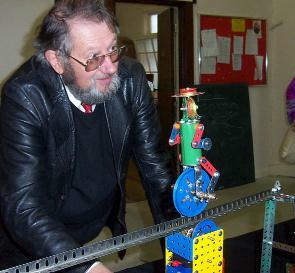 Model Engineering Exhibition, 5&6 Oct at Monash University. Model Train Expo and Hobby Show, 16&17 Nov at World Vision Centre. Tony Press remarked that he had heard independent and quite favourable comments about our display at Sandown. Over 3000 people passed through the doors and liked what they saw of the MMC! Reece Isaac has suggested that Club sponsor a specialist model building competition - a "model powered by a Magic Motor that can run the furthest distance" sort of thing. Reece was not at the meeting to provide more information but his name has been pencilled in as chairman of a sub-committee to develop the idea. Good move Reece! 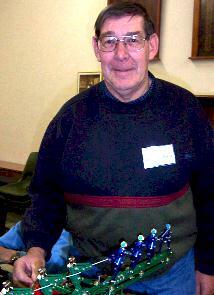 Roger Hall announced that two more sets in the "Crazy Inventors" series are available and brought along samples. One is The Bat which only just manages to flap its wings (underpowered) and the other some kind of jalopy. 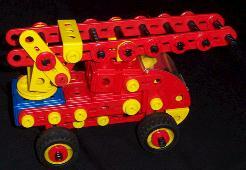 Michael Bankovski told us that he would be participating in an interview about Meccano on Radio RPH next Wednesday. It was very interesting. 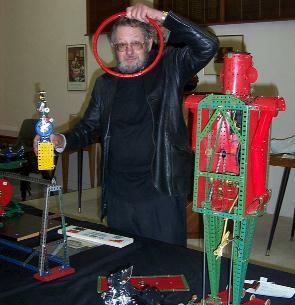 Michael put in a couple of good plugs for us and made the point that Meccano is good hobby for blind people because model building depends so much on the sense of touch. 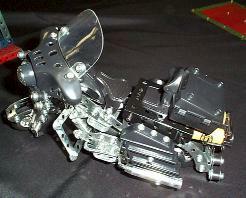 He recommends it as a hobby for blind children to help develop tactile skills. I'd never thought of it that way before. A new arrangement for displaying models was tried and very successful it was too. Tables were set up along the front of the hall and covered with our black tablecloths. This makes the models the focus of the meeting which is the way it should be, keeps them all together and makes viewing without crowding much easier. Our thanks to Mary Jost for this excellent idea. 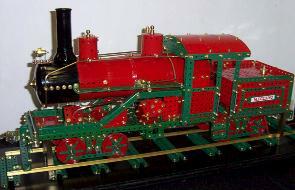 Jack Parsisson had his latest model a Heisler Locomotive based on the design by Keith Cameron. Jack found this model rather tricky to put together and many modifications were needed including some one-off Jackarno parts! 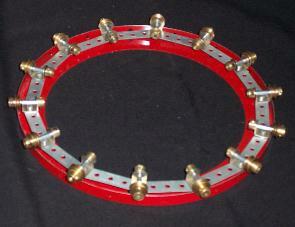 He also had a mounted flywheel made using his one piece channel segment rings. Paul Johnstone showed us his delightful freelance model of Benetton Formula 1 racing car (Formula 1 cars are by no means identical it seems). 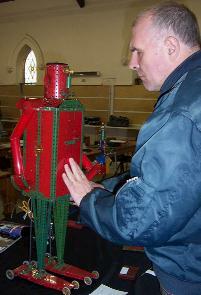 A very attractive and imaginative model, Paul. 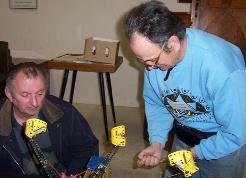 Tony Press brought along his Robot from the No 8 R/G Manual for an outing. 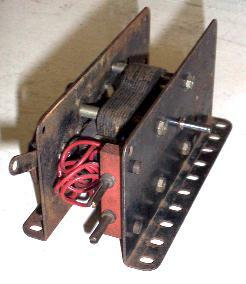 This model requires substantial strengthening and modifications to the drive mechanism if it is to be operated for any length of time. Tony has plenty of examples of well worn axle rods! John Brand's contribution was a Steel Tek Harley Davidson motor cycle. It was bought for $5 at a Garage sale for the parts but John thought he might as well make it up. 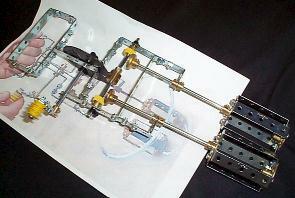 Kimball Monger produced his version of the Bernard Parrier model of the mono rail cyclist which was written up in CQ. 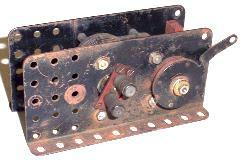 Kimball had modified the construction to suit his available parts and in particular used an all belt drive. It worked well and looks attractive. Barry McDonald's Tug o' War machine from a 1994 Meccanomans' Newsmag provided plenty of entertainment and interest. 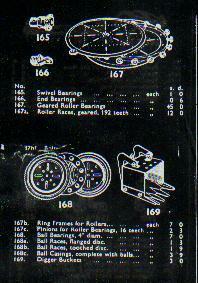 John Riley was inspired by Jim Osborne to try building a roller bearing . The framework for the spider comprises 14 x 21/2" strips and is self-centering leaving plenty of room in the middle. Sandra Hall showed us her Meccano Egg Beater (easy to clean Sandra, just take it apart) and her impression of the Meccano Web (WWW variety) as well as a fire truck modelled in French plastic Meccano. 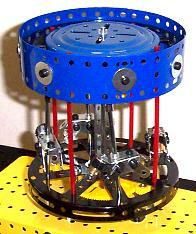 Roger Hall has constructed his free lance version of a Merry-go-Round. 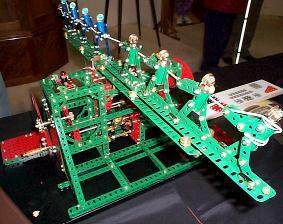 He wanted a small model that actually worked and has succeeded very well. Peter During was demonstrating his "Octopus" fairground ride. 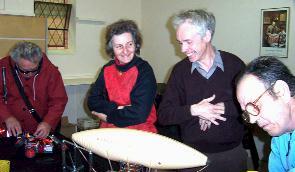 Steve Hatton brought along the Crazy Inventors Airship, one of the best models in the series. Tony van Wageningen had two models from the Evolution Series Sets, an Aeroplane and a Motor Cycle. For good measure he made up a freelance Formula 1 racing car out of the left over bits. 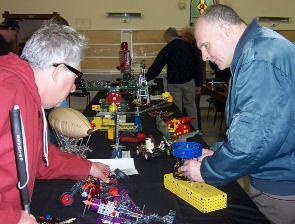 Mike Wright brought along his latest find, a 110 V Meccano Motor from Camberwell Market of all places. Definitely "for museum purposes only", Mike! Michael Bankovski exhibited a very neat and nicely finished sports car - well done, Michael. The Locomotive takes its name from its designer, Charles Heisler, a Cornell University graduate employed by the Dunkirk Manufacturing Company. The first true Heisler was built in 1894 for Patzcuaro, Mexico. In all,700 more than 700 Heislers were built. From 1930 to 1941, when the factory was closed due to WW11, 32 Heislers were made. It was used as a logging train negotiating staggering grades and switchbacks. The bogies can swing to negotiate sharp curves.